Nexø I is the most advanced rocket build and launched by CS so far. The Nexø rocket class is a technology demonstrator in advance of building the significantly bigger Spica rocket that will take our astronaut to space. 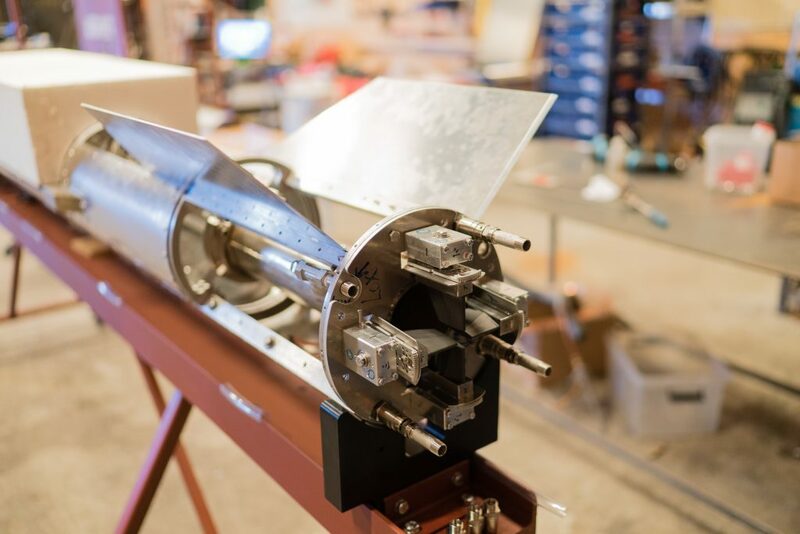 Thus, Nexø is an important part of the Spica roadmap and the technology developed and used in the Nexø class will be used in the Spica rocket. 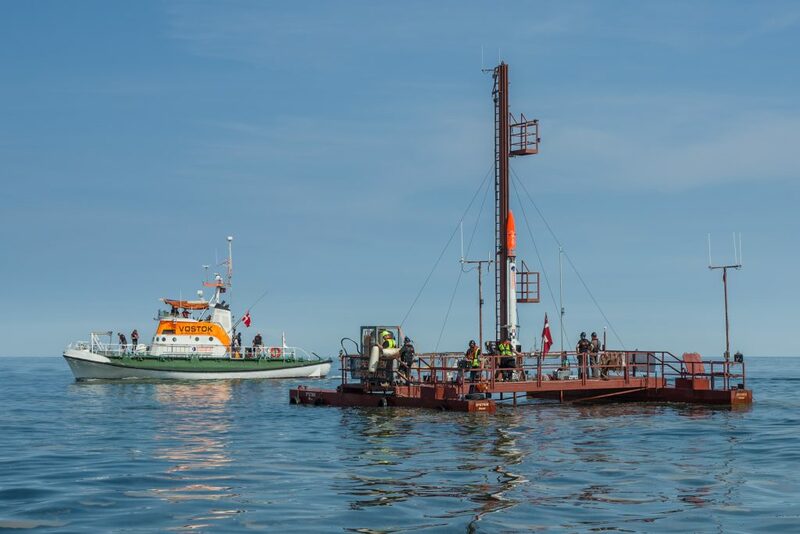 Nexø I was launched on July 23rd 2016 from our launch platform Sputnik in the Baltic Sea off the coast of Bornholm. This was our first launch of a liquid bi-propellant rocket since all of our previous rockets have been powered by hybrid rocket engines. This also meant that for the first time since the launch of HEAT-1X we would have to load propellants onto the rocket at sea. Transfer of cryogenic liquid at sea is no trivial matter, this is undoubtedly one of the most critical parts of the pre launch operations. Sputnik and Vostok in Nexø harbor Thursday night. 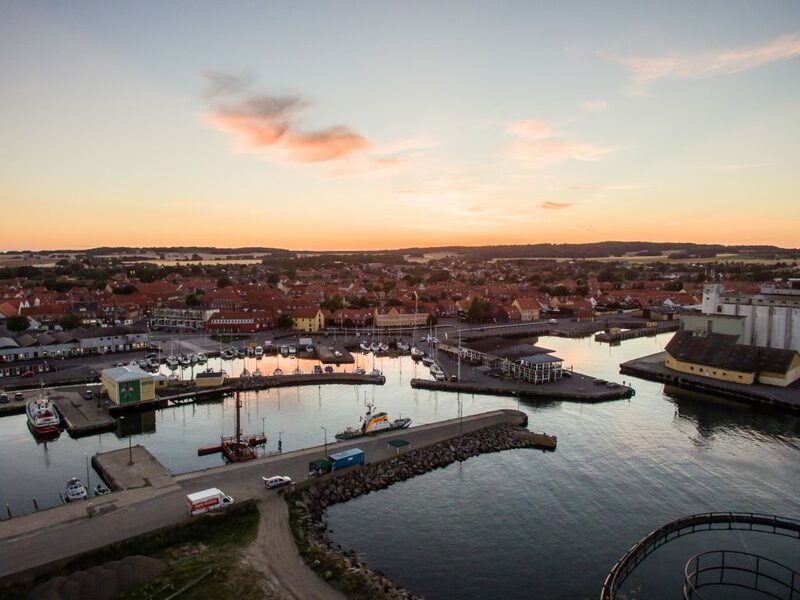 In the early morning hours of July 23rd Sputnik and her launch support vessels set out from Nexø harbor on the east coast of Bornholm headed for ESD139, the naval shooting area we use as our launch site. Upon arrival at the launch site pre launch operations commenced. Preparations for launch follow a strict checklist that includes a checkout of most of the onboard systems of the rocket, propellant loading systems and telemetry systems. This was carefully coordinated from Mission Control ship Vostok by Flight Director Thomas Pedersen. On board Sputnik, PAD Leader Jacob Skov Larsen was in charge of the launch preparation crew. Due to a few technical delays, preparations dragged out until shortly before the launch window designated by Air Traffic Control Malmö closed for the day. At 4:38 PM Nexø I majestically rose from the launch platform, carefully guided to a perfectly vertical ascent by the jet vane Thrust Vector Control (TVC) system. Nexø I accelerated slowly towards the sky but soon it became evident that the rocket was indeed accelerating too slow. Due to a valve malfunction the engine thrust was lower than expected and Nexø I only climbed to an altitude of 1500 meter before it descended again. During flight all onboard sensors downlink telemetry to Mission Control. Based on this we have put together a visualization of the flight in the video below. It shows Nexø I accelerating at only about 0.2 G during most of the flight and still the onboard control system manages to keep it flying perfectly vertical. The low acceleration is naturally not desirable but we are extremely pleased with the ability of our guidance system to keep the rocket vertical under such circumstances. Due to valve malfunction Nexø I never got to unleash its full potential. We are however still in a learning phase and the primary objective of the Nexø rockets is for us to develop the necessary systems and technology and to learn from errors such as this one. In that sense, we are very happy that this error occurred on a Nexø rocket rather than a 4000 kg heavy Spica rocket! Nexø is powered by our own BPM5 engine providing a nominal thrust of 5000 N. It is one of our smaller rockets measuring 300 mm in diameter, 5.6 meter in height and have a Gross Lift Off Weight (GLOW) of 205 kg. The propellant tanks and the main structure are made in aluminium to keep it as light as possible. The nose cone and parachute bucket are made in carbon fibre to reduce weight. 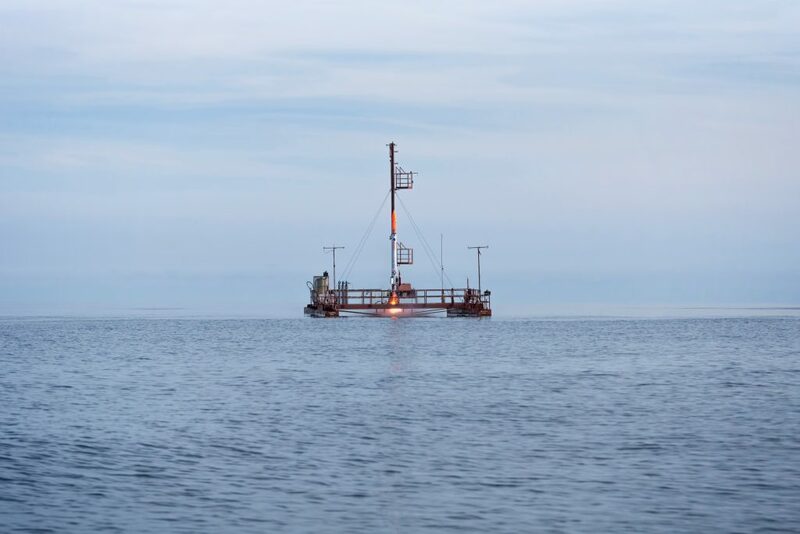 Nexø I is actively guided by our own custom build Guidance and Navigation Computer (GNC). A set of four graphite jet vanes are used as the Thrust Vector Control system (TVC) commanded by the GNC. This is a further development to the system used on the successful launch of the Sapphire rocket in 2013. The jet vane system has been rigorously tested during engine static test firings were we have measured the forces on the jet vanes, the jet vane temperature and erosion rate. It is thanks to this hard work that the guidance system was able to perform so well as it did during flight and keep the rocket vertical despite the low acceleration. The Factory Acceptance Test was carried out on a mock up launch rail setup outside the workshop. Nexø I was mounted on the rail and all the electronic systems where verified to be operational. Then a cold soak test was performed where the LOX tank was filled with liquid nitrogen in order to see how the entire system would react to the cryogenic conditions. Finally the main LOX valve was opened to verify cryogenic valve operation. 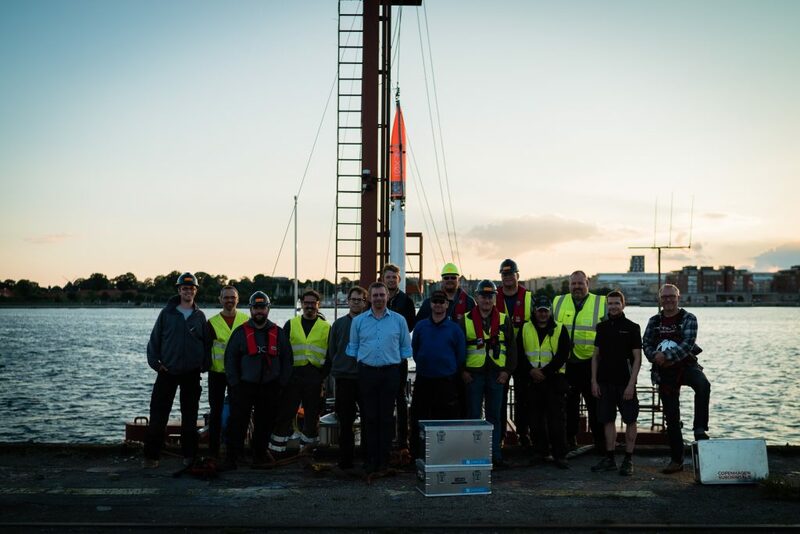 We also conducted a Harbor Acceptance Test with Nexø I on Sputnik, our launch vessel. Once again all systems were tested to ensure fault free operation. Finally, on June 26th 2016 we performed the last test, the Sea Acceptance Test. For this test we performed a simulated launch while Sputnik was sailing around the Copenhagen harbor. The test ended with a successful “launch”, i.e. successful system operation shrouding Nexø I and Sputnik in a big cloud of nitrogen as the LOX was was emptied. Nexø I is partially funded through an Indiegogo campaign. One of the perks of the campaign was to get your photo on the rocket! 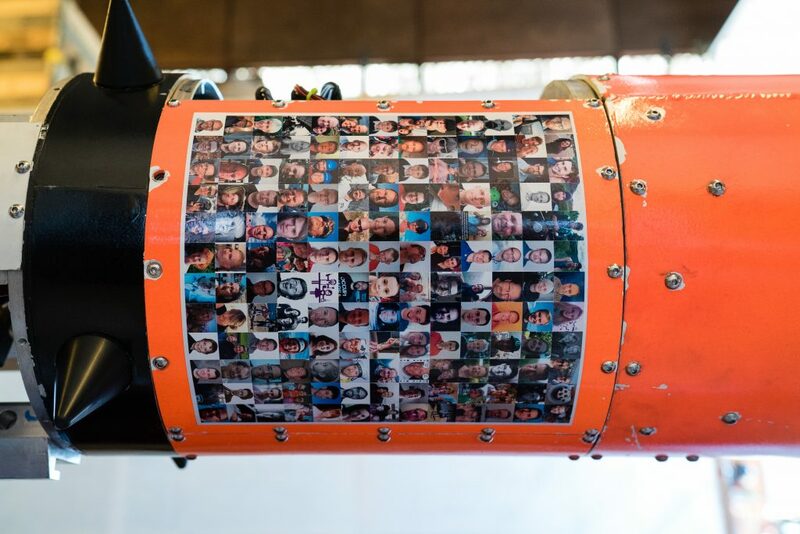 Thus, the avionics compartment is covered by a mosaic of people from around the world who have contributed to building Nexø I.